Pact Centre for Emerging Artists presents 3QUARED (2) = 9 Fantastic Fabrications at the Pact Theatre, Erskineville. The Pact Centre for Emerging Artists has collected a two-part program called 3QUARED=9 Fantastic Fabrications (the first opened on Thursday the 8th September, the next opens on the 22nd). I attended a meeting the other day which defined the difference between the FRINGE and the CO-OP scene. The Fringe was described as an opportunity for young artists to get their work out of the living room or garage and into a space where more than friends and family might see it. I have found that very helpful in guiding my responses. A 'real'audience will help the artist see their work and its possibilities more sharply and quickly. Where the strengths and weaknesses are. There are four components to this first evening of emerging artists at PACT. The first is a hybrid play, RE:LEASE presented by a collaborative called Fishwife. This is their début production. The script is written, directed and produced by Aarin Starkey and Anna Chase. They are also in it. Very Judy Garland/Mickey Rooney "Let's put on a Show" from the Andy Hardy movies (remember them?). What this collective does not have, that is different to Judy and Mickey's enterprise, is a production house or budget. The script is a hybrid of The ROCKY HORROR SHOW (without songs), THE LEAGUE OF GENTLEMEN, PSYCHOVILLE, THE ISLAND OF DOCTOR MOREAU and even BEING HUMAN. Other origins, I'm sure. A mad transvestite figure traps some innocents in a lease house and they convert to some other grotesque life forms. It is all very silly and deeply embryonic in the writing and performed mostly for themselves, their families and friends. The set and lighting is extremely rudimentary but the final costumes are quite the best things about it all. Nonsense and enthusiasm. These are emerging artists, but just barely. They are having way too much fun. They seemed to have forgotten the audience that have no emotional stakes attached to them. We found it a bit too silly and trite, despite their friends encouraging laughs. If the work does not have substance/content then it must have style. Style requires honed skills. It is very, very hard to achieve. NEXT: CLOWN LIGHTS STAGE, writer,designer and performer, Alice Mary Cooper. This is a work that I have seen before at the Shopfront Contemporary Arts program at Kogarah, mentored by Michael Piggot. It was probably a year ago. The premise is that Alice Cooper is scheduled to give a lecture/demonstration on Theatre, Modern Theatre Theory (!!!) but is struck down by a car and so her inner clown - alternate persona attempts to substitute. A bumbling and droll experience is presented. It is amusing and sometimes glimmers with the potential to become something of interest. There is intelligence and courage. Nothing much as changed since last time I saw it. The material is promising, the performance can be cutely appealing but the work lacks energy and rigour. It does not have a clear objective of need from the creator. There is a lack of a passionate rigour in the pursuit of the journey, rather it appears to meander about (and that is partly deliberate but too under-directed to easily discern) and sometimes the audience is way ahead of the clown and the material and the 'presenting' of the jokes. The narrative becomes slightly boring. Maybe it is too long as well. NEXT: DUST, a movement (Dance) piece created and performed by Emeline Forster. This work comes from a serious artist. The research and especially the video artistry is well prepared. DUST won the Melbourne Fringe Award for Best Dance. Based about the true story of a defiant householder defying the Coal Mining Industry it explores abstracted movement and juxtaposed images. It uses the video elements and shadow work inventively. An air of sophisticated earnestness is communicated. Sometimes it feels like a thesis work, ticking boxes of criteria for presentation etc. It does need editing. Sometimes action continued for no other apparent reason than to fit the length of the recorded music (Terry Hart) - e.g. the coal dropping from the bucket in the first sequence. There is an old rule/adage that if you don't capture your audience within the fist few minutes you are going to have a hell of a time keeping us attentive. This is what happened to me. I was bored then wooed in , but alternately in and out too much to be completely satisfied as an audience. 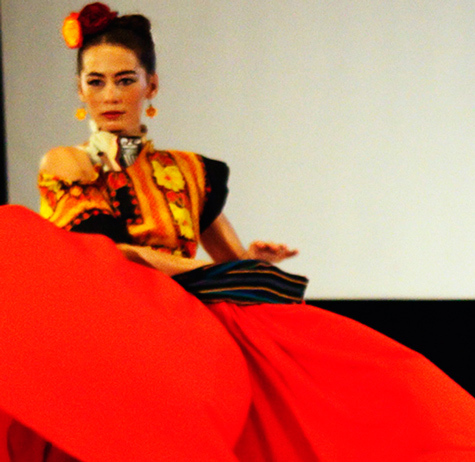 NEXT: LAS DOS FRIDAS is a physical interpretation of Frida Kahlo's art works. It is built around the circus skills of the performer/director Meiwah Williams and her passion for the paintings of Frida Kahlo, three in particular: La Calavera Catrina (The Elegant Skull), La Malinnche, and La Llorona (The Weeping Woman). The set and costume design is elaborately prepared (painting of costumes David Walsh). The technical preparation to utilise the circus skills of Ms Williams detailed. The work is presented with a sense of commitment and reverence for the painter. Unfortunately, it is too reverential (sinfully idolatrous in instances) and the reason for giving this piece of the work or that piece of the work does not have the rigour of engagement. It needs more artistic ruthlessness. Why this bit? What will the audience learn? Will it be a transformative journey for the audience or just a disguised display of the performers skill? How should the audience be different when they leave the space as a result of this experience? Like the Julie Taymour film it does tend to feel too romantic and beautifully 'art-directed' for its own good. What next for Ms Williams and her team? Interesting to see, for here is a sincere artist attempting to find a new way to express her gifts and interests at work here. Emerging artist.